The structure of a pearl begins with a tiny grain of sand (or other irritant). While this minuscule particle seems unlikely to affect a change in the mollusk or oyster it ends up in, over time it becomes covered with hard, smooth layers. Day after day, month after month, the layers (called nacre) build upon each other, adding bit by bit to the exquisite luster and sheen of the gem. When looking upon the finished creamy orb, one would never imagine that this accomplishment began as a small speck of sand. The symbol is clearly that of a well developed and promising relationship. There are many reasons why one might want to acquire a pearl engagement ring, as opposed to a diamond or other precious stone. The main reason would be the cost. While diamond rings are the universal symbol for faithfulness and commitment, a pearl, which can take up to ten years to produce, embodies that same promise of commitment without putting a dent in your life-savings. Pearl settings are versatile and they can be arranged in many different shapes, sizes, and even colors. There are many factors that go into deciding on and purchasing a pearl, many of which have to do with personal preference and liking, while others are more universal and practical. When looking at pearls in general, one must be aware of several factors and characteristics that are unique to pearls. Firstly, there is a difference between cultured pearls and natural pearls. Natural pearls, meaning pearls that form in nature without the assistance of a person either caring for, or implanting an irritant into the oyster/mollusk, are very rare. The chances of finding a marketable pearl in good enough condition in nature is very difficult, therefore they are priced higher than cultured pearls. Cultured pearls, pearls that were grown through the assistance of someone inserting an irritant into the tissue of the mollusk, are farmed and industrialized and therefore priced much lower. Cultured pearls are just as real as natural pearls, they are simply grown organically according to the process of those in nature. Most pearls on the market today are cultured pearls. The difference is detectable through the use of an x-ray. Secondly, pearls are classified according to grade. The grade is used to determine the pearls type, thickness of nacre, luster, surface, color, shape, and size. There are many different pearl varieties, and depending on which you choose, the price range may vary. The nacre, as mentioned earlier, is the actual body of the pearl which surrounds the irritant (nucleus). The thicker the nacre, the greater the pearl’s value. The luster of a pearl is the shine or reflectivity of the surface. If a pearl is chalky or dull, the luster is of lower quality. Salt water pearls generally have higher quality luster than fresh water pearls. The surface of the pearl is of critical importance. Great care must be taken to ensure that the pearls surface is free of bumps, dents, discoloration, or marks. As far as pearl shapes, perfectly round pearls are difficult to come by. They are more expensive and rarer than other pearl shapes. Although there are many options including baroque, drop, round, etc. a favorite for rings is the popular button shape, in which one side of the orb is slightly flattened, making it lay lower on the finger without losing its rounded shape. The color, shape, and size of the pearl will most likely depend on personal interest and desire and be influenced greatly by the image one is hoping to achieve. Although there is no set grading system that is used world-wide, most sellers will use the A-AAA grading system, AAA indicating when the different characteristics of the pearl are of greatest quality, and A when the characteristics are lesser. Ask about each aspect mentioned above when searching for your pearl. Also, any seller who indicates a pearl’s quality as AAAA or AAA+ is not considered a reputable source for grading, as these grades were invented solely to raise the price of the pearl and mean very little. The one factor that a pearl owner must be aware of is the delicacy in which pearls need to be handled. As they are not classified as ‘stone’, pearls are more delicate than most precious stones and gems. They can be nicked or scratched if not handled properly, and there is greater care needed in cleaning them and maintaining their appearance. Pearls should never be placed in an ultrasonic jewelry cleaner, and should be kept away from abrasives which will ruin their shine and luster. Alcohol, found in perfume and some hair products, is also harmful to pearls, therefore be sure to apply all creams, perfumes, etc. before adorning your ring. Water or liquid is harmful in prolonged exposure, so be sure to wipe your pearl with a moist/damp or dry cloth. To clean a pearl, use gentle soap and water, and wipe with a non-abrasive cloth or allow time to air-dry before storing or wearing. 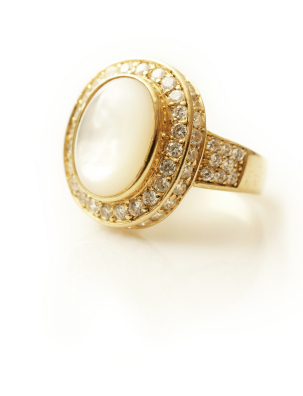 Because other stronger objects can scratch pearls, be sure to store your ring separately from the rest of your jewelry. Also, because of its malleable material, it is possible for a pearl to come loose and become dislodged from its setting. One way of avoiding this problem may be to purchase a button style pearl, or one that does not extend too far off the finger. Careful care can keep pearls from dehydrating, delaminating, and otherwise becoming disfigured or acquiring defects. Before you leave the house to go ring-hunting, you should be aware of the different options available to you and have an idea of what you’re looking for. There are many different pearl engagement ring styles, from antique to modern. As with any ring, have an idea of what metal you would like the band to be constructed from. Also, there are many options of precious stones to set, either in the band itself, or alongside your pearl if you aren’t searching for a stand-alone pearl engagement ring. Adding stones or designing the setting style is a way of personalizing your engagement ring and creating a special symbol for you and your fiancé. Incorporating birthstones (his or hers) or heirlooms into your ring may ensure that she says ‘yes’, and honestly adores the gift you’ve given her. Keep in mind, all of these variables will affect the price of the ring. In general, there are some tips one may follow for determining one’s ring size. Firstly, be sure to check the finger on which you will be wearing your band. Secondly, only check your finger size at the end of the day and in room-temperature, when your fingers are at their largest size. A good method may be marking the diameter of your finger by wrapping a piece of string around, measuring it using a ruler, and dividing that circumference by 3.14. Then, check your measurement against a standard ring chart. An easier process may be to go to a local jewelry store and try on sizing-ring bands. If you choose this method, however, make sure that the width of the band is similar to the width of your decided ring, as it may fit slightly differently otherwise. When searching for pearl engagement rings, it’s best to request to see the whole selection of pearl rings and leave the e-word out. That way you will ensure a wider range and larger selection that is not especially priced for “special occasions” but may be equal quality and design for popping the question. Be sure to check the authenticity of the pearl with the dealer and a jeweler, and purchase a lifetime warranty, as pearls are delicate. For a quick test of authenticity, rub the pearl against your front tooth- a fake pearl will feel completely smooth, while a real pearl will feel slightly rough. A stand-alone Pearl Engagement Ring (cultured) may cost anywhere from as low as 100 to 2,000 dollars, depending on size, quality, and setting of the pearl. As mentioned earlier, the method in which the pearl was grown (naturally or cultured) will also affect the price. Whereas a cultured pearl is priced according to the measure of its size in millimeters, a natural pearl is measured in carat weight. Also, the cost will inevitably raise if additional precious stones or better quality metal is used. It is admittedly more difficult to find pearl engagement rings than the traditional diamond band, but it is by no means impossible. Most jewelers will have some selection of pearl engagement rings. As mentioned above, your chances of finding your ring will increase if you request to see the full selection of ‘pearl rings’. At more well-known jewelers, it may be difficult to locate a variety of choices, so it may be best to stick to those jewelers who specialize in pearl jewelry. American Pearl, in New York, NY, is a reputable source for purchasing pearl engagement rings. Due to its extended range of pearl and band design types, reputation for producing grade-AAA quality pearls, and extremely reasonable prices, American Pearl is likely to carry whatever style you are seeking. Zales offers a beautiful selection of freshwater cultured pearl engagement rings, some set with diamonds, with prices ranging from 50-800 dollars. Many other stores have similar offers, both online and at store locations. While pearls are not the traditional or average engagement ring, your engagement is not average. It is a promise, a shinning beautiful specimen that will, if treated to many years of cumulative giving and tender care, become a lustrous orb of warm and radiant love.